Shop Talk – New Chop Saw to Cut Aluminum! In this episode, we will be looking at a new Ryobi 7-1/4″ 18V Miter Saw R ZRP551 (see more here: amzn.to/2BYlruv ) as a portable (handy) solution to cutting a lot of V-Slot Linear Rail (see more here: amzn.to/2BXUaYT) for a couple different build projects I am working on. Opinion: The saw has plenty of power to reasonably cut though aluminum linear rail as exampled by the 120 fps video inlay. However the provided carbide tipped blade is NOT best suited for the task and should NOT be used. 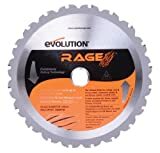 While it does work in creating a “reasonable” cut, the coarseness of the blade, wider kerf and other factors such as the slower RPM speed tended to create a shrapnel effect with the cut-off material. Better blade options would be: amzn.to/2GVtDkV or amzn.to/2BYvpvQ and for mixed mode materials: amzn.to/2F81Nza. ← GeeeTech A10M – Mixing ABS with TPU Complete Fail!